Will happily consider requests for free review copies if you take a photos, use them in play or say nice things on blogs and forums. Okay... off to bed... will catch up with everybody soon. 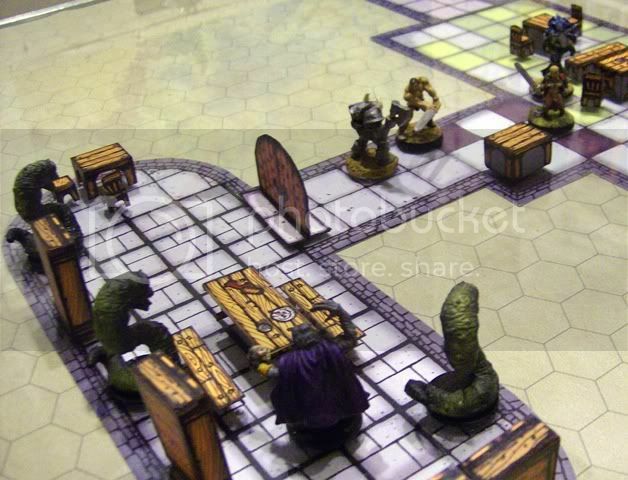 May i report your offer to the italian Heroquest forum? I'm unsure if some will like to fullfill your request but there's a lot of creative ppl there. Been experimenting with some photos. Again, I'm okay at drawing this stuff, but my folding and gluing is still a bit on the amateur side. 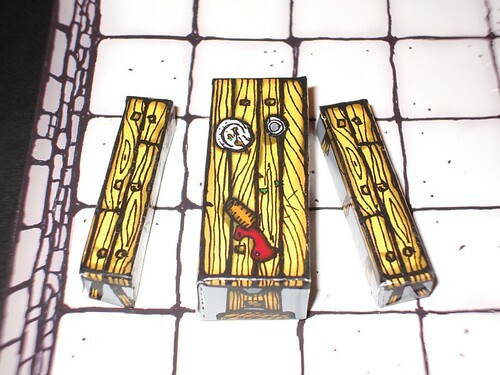 It's possible to lie the shelves face down to represent a large crate. These are working out very well. I'm building some right now. Just a heads up the bookases are a little narrow at the base and are easy to knock over. I solved this by tossing a spoonful of rice in them before I close the box. It gives them some ballast and makes 'em stand up better. I'll post some picke when I am done. I'll be posting that in my "Support" section on my website. I went out and bought some plasticine today - it's pretty hard to find weights which are the right size. 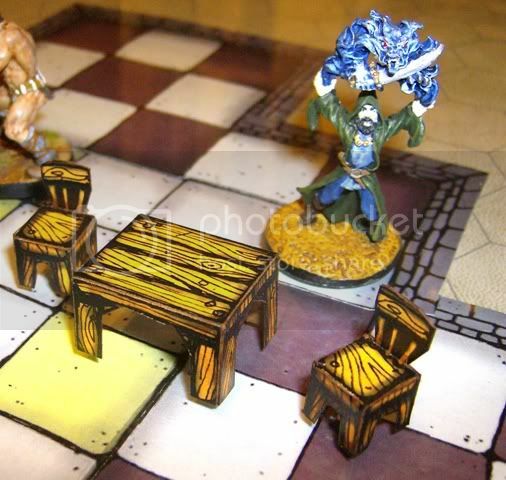 Why not some washers glued to the base? Good, good, I like it! Tiny washers - metal, flat. Excellent. Pennies are the cheapest way as long as the item isn't too small. Then go get a box of nuts as they usually sell them by count and not by weight. The nuts are more compact than washers and weigh a bit more. I'm more in favor of not gluing for items that can be tipped over. Loose weights will make an item more stable in whichever orientation you place it. Vehicles or furniture that is tipped over would have a tendency to tip back upright if the ballast was glued to the bottom. 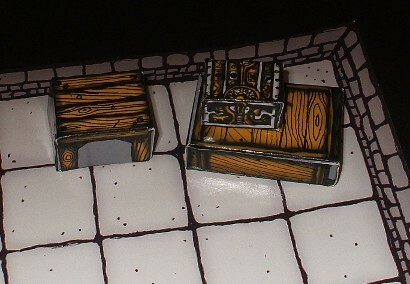 I rather like having loose weights inside (love the bolt idea), but it can be a problem when the scenery gets so small. Yes, times are hard - use dirt! 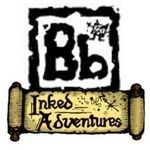 Save money up for future Inked Adventures products. For "ballast" for small papercraft models, I would use dry couscous or rice. It's cheap, and you never cook couscous just right anyway, so you're not missing out. I've started using lentils as ballast for larger models. I'm never going to cook lentils. I have a ricemaker and tons of rice on hand, so it is easy, but there are a million alternatives. I like loose grains because you can easily rotate the item and it is typically easy to install. 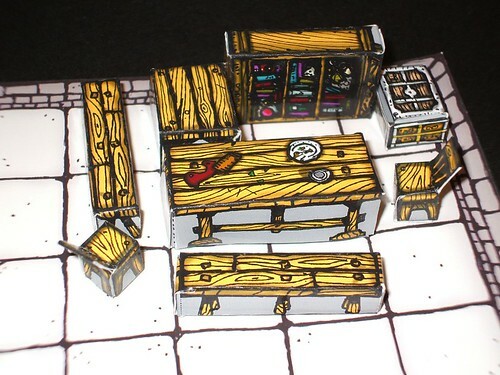 I played around with the construction on a few pieces and you can get table and chairs that are empty on the bottom, and though it took a bit of doing (and two printed copies) you can make a feasting table that looks pretty impressive so that it is not a box, but more like a 2.5D prop. Thanks for the great product…. Nice construction Sammo! That feasting table screams "tavern brawl!" I like this layout. It is pleasing to the eyes without being too complex. 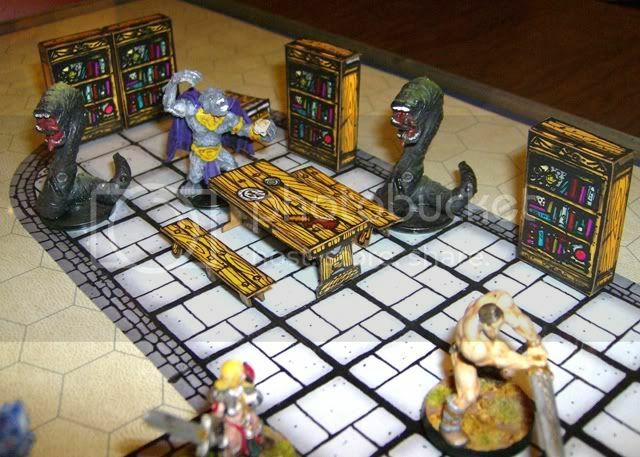 Back in the 80's, I used to draw out my tiles and furniture on thick poster board. They looked just like this. 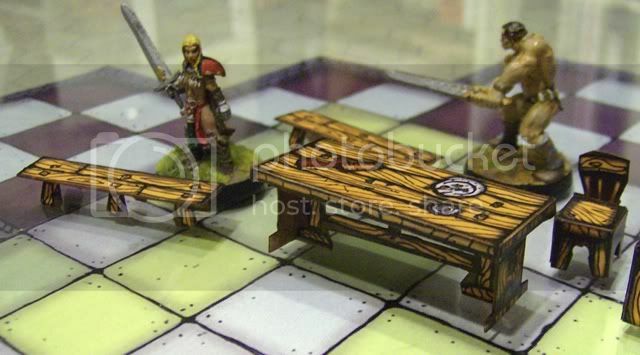 Thanks to Parduz gaming community links, a HeroQuest player, Yon, on an It has put together some nice images of the furniture with an HQ board and figures. Very nice ... are you looking to do more furnishings in the future? Any chance to have the Sammo mods included in the PDF, so each user can choose his right way? All of my mods were done at the workbench during assembly, so there really isn't anything to include with the download. If I get some extra time I could post a "how to" in assembling the furniture, but that might take me little while to put together. Most of it is pretty straightforward, but on the bench it seems that you have the legs in the center of the bench, yet it doesn't topple. EDIT: ah, two sets of legs inset from the edge. nice. 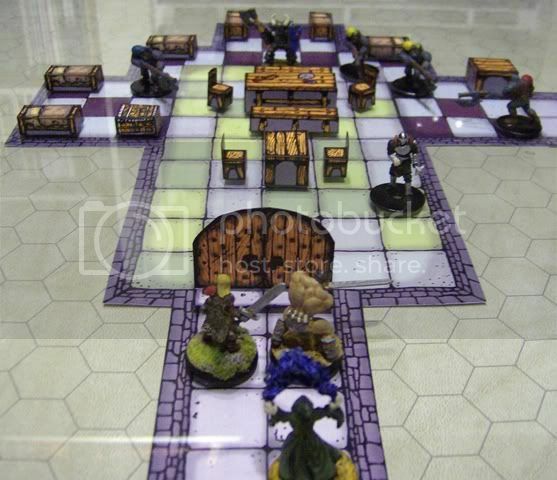 I like how everything seems to be levitating about the thickness of clear plexiglass above the floor tiles. Yup. Sammo seems to have conquered any card curl with that clever glass business as well. 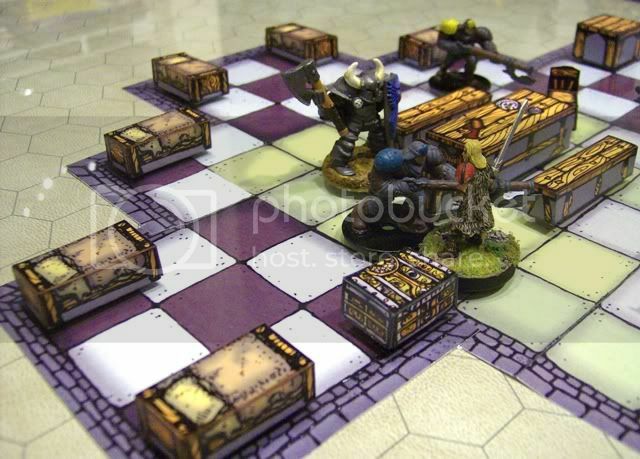 Parduz's Hero Quest forum friends have come up with some more pics (I haven't quite organised them yet). 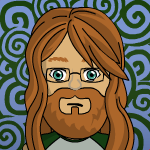 I'm posting everything up in my (make-shift) Gallery page on the Inked Adventures site. 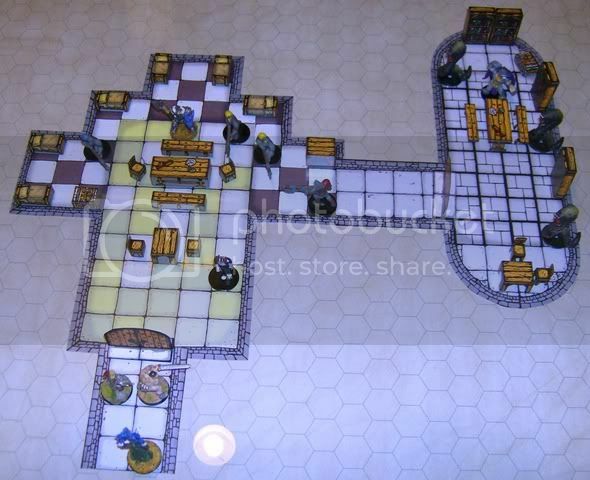 I'm pretty sure that people can tell the difference between my stuff and other elements in the photos, like Hero Quest boards. ;D I'm resisting the urge to write lots of disclaimers about which companies own what - especially if they are genuine gamer/fan/community photos. I could have sworn someone (verminking?) posted a query about further 3D furniture, but I've been focussing a bit on PMs and didn't get around to answering - apologies. I had a request for some tents recently. Pillars are also a must. 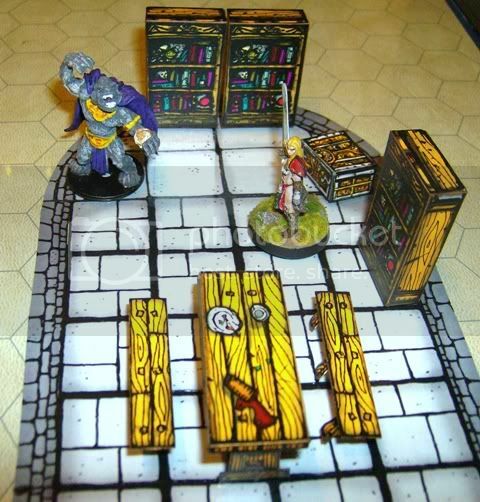 Any thoughts on in-room 3D dungeon essentials? We've got chairs, tables, shelves, one type of chest and a single bed so far.